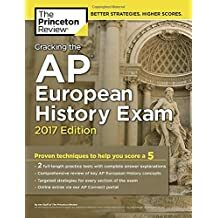 The Best AP European History Study Guide Available- Period! This an an excellent study guide for the 2016 AP Euro exam. 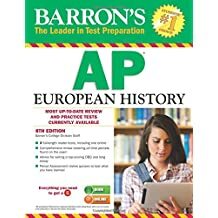 I self-studied for the exam this year and can say with confidence that the Princeton Review AP Euro series contains a tremendous amount of AP Euro content and strategies. In order to study for the exam, I watched YouTube videos, did questions on Learnorator, and read two review books. This strategy was extremely effective; I was confident answering almost every question on the test. If you are aiming for less than what I wanted, lower than a 4 or 5, this book alone will most likely earn you it. Has helped my child tremendously! This book contains all of the information, plus a lot more, that you'll need for the AP exam. Also, it has great practice AP exams that helped me worm on my free responses and Multiple choice. The most useful part of this book was the chapters that thoroughly explain how to get full scores on the DBQ/long essay. if you feel like your Euro teacher hasn't explained the AP essay scoring system well, then you should definitely get this book. I found this book useful as an APEH teacher. The opening sections provide a fair overview of the new exam. Periods, Themes and Skills are laid out nicely. There are helpful models for outlining and drafting DBQs and LEs. This is one of the larger review books that provides unit overviews with a substantial amount of content for a review book. It also provides MC questions, SA questions, LE and DBQ for each unit. All those things I've found very helpful, especially as I tried to scrounge up stuff that is consistent with the new exam for each unit. Barron's has saved me some time. There are some fantastic short Primary Sources in here. Those are always helpful. 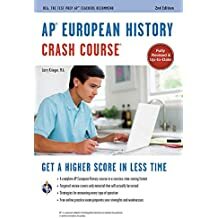 If you're an AP Euro student, this book will help you out substantially if you take the time to review the content and master the reading and writing skills for each unit. Overall, the book was helpful in reviewing for the AP European History Exam. Its material review was relatively comprehensive. However, it failed to cover the Ottoman Empire and the Austro-Hungarian Empire in some time periods. The book's free response questions are well written, but its multiple choice questions are a lot easier than actual AP Exam questions. Also, the practice tests in the book reuse questions from test to test. Really valuable tool for the AP European History Exam! Crash Course AP European History is exactly what it claims to be: a brief, clear review of AP European History for students who waited til the "last minute" (i.e., a few weeks) to study for the exam. Folks complaining that it doesn't have 2 full practice exams haven't paid attention to the description of the book--it doesn't claim to Do It All. It's much smaller than the full size study guides on purpose; great to keep in your backpack for quick unit reviews. I've taught AP Euro over 20 years and always recommend it to my students. This book saved me for the European History exam. Unlike the Princeton Review and Barron's book, it only contains the necessary information needed for the AP test, which makes it perfect for cramming. Only warning is that it is very information dense, because everything on it has a purpose and is necessary to know for the AP test, but it is a relatively small book. Combined with the Princeton Review AP review book, you'll be prepared for thw AP exam. This book goes directly into the information, breaking it down into concise topics. While I used the other book for the practices it had. Good luck with your AP exam!! !